Find out about Duhaime Law, the law firm and his tongue-in-cheek FAQs. Find out more about www.duhaime.org, the website or the Duhaime.org Bibliography. Mr. Duhaime's first book was a regional almanac of Quebec North Shore published by Quebecor. His 2nd book was De Puissance Comblée. Baie-Comeau: 50 Ans d'Histoire (a 192-page history of the town of my birth and formative years, published in 1986). Find out about Lloyd's 3rd published book, the 1992 Hear! Hear! 125 Years of Debate in Canada's House of Commons. Mr. Duhaime has also written The Musket And The Cane: The History of the Duhaime Family in North America, recently put online at duhaime.org/DuhaimeFamilyHistory.aspx. Pour les francophones, il y as un article publié en déc. 2013 par la Société francophone de Victoria a son égard, se référant au site Duhaime.org et a un prix octroyé par le Victoria Bar Association. "As a lawyer, I am before and above all things for the supremacy of law." Founding lawyer of Duhaime Law, Mr. Lloyd Duhaime has enjoyed a 29-year career which has engaged him in many fields of law: administrative law; parliamentary law; criminal and extradition law; immigration law; international law; tort/personal injury and defamation law; real estate law; family law; wills, estates, probate and elder law; employment law; company and commercial law; intellectual property law; and, along the way, experienced and experiencing every form and variety of litigation known to North American law: criminal courts and process, courts, mediation, arbitration, administrative tribunals, rules of court, and the most important variety of all lawyering: negotiation and settlement. His practice presently focuses on company and commercial law, family law and elder law, with the latter being his primary area of focus (quoted in the 2013 Annual Report of the British Columbia Ombudsperson). Lloyd appears before administrative tribunals as required for his clients, and most frequently before the Supreme Court of British Columbia and to a lesser degree at this time, the Provincial Court of British Columbia, and the British Columbia Court of Appeal. Fluently bilingual, he obtained his LL.B. from the Université de Montreal Law School in 1984. 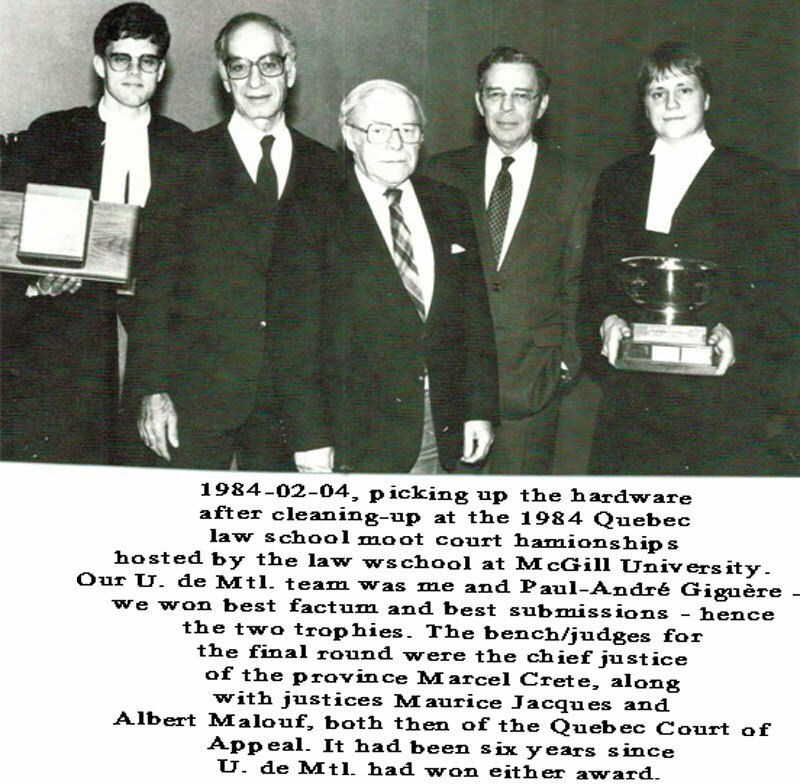 As a law student, Lloyd (along with classmate André-Philippe Giguere) won the provincial moot court championship judged by the Chief Justice of Québec and two of his colleagues of the Québec Court of Appeal. Lloyd articled in Baie-Comeau, Quebec and was called to the Barreau du Quebec in 1985, the Law Society of British Columbia in 1998 and the Law Society of Alberta in 2000. Lloyd's articles and subsequent practice as a member of the Barreau du Québec in Baie-Comeau (Northern Québec) gave him considerable courtroom experience in both criminal and civil cases before the Cour supérieure and the Cour du Québec. In 1985, Maître Duhaime became Legislative Counsel to the Minister of National Defence and later, to the Minister of Consumer and Corporate affairs (now Industry Canada). In 1987, he was appointed General Counsel and Director of Policy of the Standards Council of Canada, a Federal Crown corporation, a position he held until 1995 save and except a one-year secondment in 1993 as Legislative Assistant to the Minister of Justice and Attorney General for Canada. During his tenure with the Standards Council of Canada, he represented Canada in several international standards and related legal negotiations and conferences. While with the Minister of Justice, he was Legislative Counsel of a team that managed the successful passage of seven bills through the House of Commons in a single Session of Parliament. Lloyd has been counsel in numerous trials and appeals before all levels of courts in the Province of Québec and the Province of British Columbia, as well as before the Court of Appeal of Alberta and the Supreme Court of Canada. Lloyd has always been an enthusiastic participant in his chosen field, is a past-columnist and author of thousands of legal information and legal affairs articles in publications such as the Toronto Star, the Montréal Gazette, the Hill Times, the Lawyers Weekly, the Journal le Barreau and the Canadian Bar Association's flagship magazine, the National, as well as the author of seven books including Hear! Hear! 100 Years of Debate in the House of Commons and as a contributor to the world's oldest law blog, Duhaime's LAWmag. In 2006-2007, he was a law professor at Camosun College School of Business teaching civil litigation, business law, family law and wills and estates. He was named Canadian Lawyer of the Week by the Lawyers Weekly in 2009, primarily for his contributions towards access to justice through Duhaime.org. From 1995 to 1998, he was the manager of the British Columbia office of enforcement of inter-jurisdictional support orders, Ministry of Justice, Victoria, British Columbia, a job he held as he also met a common law equivalency curriculum and exams through the Federation of Law Societies of Canada. From 2005 to 2011, Lloyd was researcher, writer and lecturer for the People’s Law School and the Association des juristes d'expression francaise de la Colombie-britannique in several province-wide public speaking tours on the subjects of consumer law, family law, elder law and intellectual property. 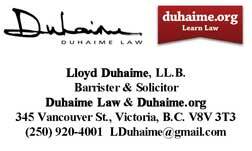 A lifelong insatiable passion for law and continuing education is behind his common law, civil law and international law legal information, legal history, legal humour and crime prevention/personal safety website, Duhaime.org | Learn Law™ and Duhaime's Legal Citations & Abbreviations. Duhaime.org | Learn Law is the oldest (1992) and most visited private legal information website in the world with 3-million visitors in 2011, 4.5-million page views, and visitors from almost every country in the world. Lloyd's impressive collection of legal writings on the website have been used as resource material by hundreds of colleges and universities and law schools (see partial list below). His innovative approach to access to justice has been well documented such as in this 1999 article which appeared in the Victoria, BC weekly newspaper Monday Magazine. Lloyd Duhaime has been a guest lecturer for numerous legal education and professional development seminars and conferences of the Canadian Bar Association, the Continuing Legal Education Society of British Columbia, as well as the University of Victoria Faculty of Law and the University of Milan Faculty of Law, and a past contributor to the Law Society of British Columbia annual practice materials (family law). He has also had his own radio show at CILS-FM in Victoria ("A Qui De Droit"), as well as participating (2010-2011), as host/commentator for episodes of estate law documentaries broadcast on the Discovery Channel in Canada and the USA. He is presently a member of the Law Society of British Columbia, the Canadian Bar Association, the Victoria Bar Association, and a past member of the Trial Lawyers Association of British Columbia. In addition to his website, Mr. Duhaime's community activities include membership and past chair of the board, Fairfield United Church, as well as a youth softball and basketball coach. After wife and family, he loves playing ice hockey (goaltender), Bikram hot yoga and spending time in any law library.